The book consists of 19 s on different subjects and in different dimensions, with particular emphasis on the post-harvest handling and processing of fruits and vegetables, including mushrooms. Scope for the technology on fruits and vegetables, non-destructive methods to evaluate fresh quality, radiation preservation, chemistry of pectin and pigments and their applications, nutraceutical compounds, membrane processing of liquid fruits, dehydrated and intermediate moisture products,importance of bamboo and mushrooms as food, influence of process conditions on product quality, food additives in product preparation, packaging aspects, microbiological safety concerns, relevant analytical methods, mushroom nutraceuticals and bio-technological interventions for improvement of banana with a final note on conclusions in the last . Fruits and vegetables represent highly perishable items of agriculture, mainly because of their high water content in fresh form. Their production, yield and management under agriculture is dealt essentially under horticulture. They abound in species and varieties in different geographic regions of the world, influenced by the agro-climatic conditions. Some are endemic and confined to certain geographic regions only. Accordingly, they may be tropical, sub-tropical or temperate, depending on their requirements of temperature for growth and yield. The world production of fruits and vegetables are estimated to be ~ 499 and 893 million tons respectively (FAO, 2008). Indian production figures are at 51 and 72 million tons for fresh fruits and vegetables respectively. Post harvest losses are pronounced to be at ~25%, equivalent to loss of Rs. 25,000 crores. Fruits and vegetables vary greatly in their protective covering, peel or rind, and also in shape, size, color, texture and flavor. Their care starts from the field of harvest, including pre-harvest care to reduce post-harvest infections and maintain quality. Once after harvest, transportation assumes greater importance, over the distance to market. Thus, conditions of transportation are very vital to ensure prevention from physical damage. Fruits in mature but unripe green state can withstand transportation to the sites of marketing. During transportation, the fruits require to be held in unripe condition and thus, any ethylene produced is absorbed by use of scavengers so that ripening is prevented. Depending on the rate of respiration and metabolism (climacteric or non climacteric), the unripe fruits are stored in modified atmosphere or controlled atmosphere conditions at different temperatures, for prolonging the fresh storage life. This involves conditioning of the storage temperature too. The storage temperatures are varied and thus temperate fruits like apple require low temperature like ~ 2ºC, whereas tropical fruits like mango and banana need high optimum storage temperature like ~ 13ºC. Thus, the protocols evolved for the transportation of fruits over the seas for trade include transportation in containers under chilled conditions, preferably with regulated atmospheric gas concentrations to further promote storage life. Once the fruits reach the destination, the fruits to market are treated with ethylene in gas or liquid form, to enhance ripening that involves fruit softening, coloration and development of flavor and sweetness. Farmers and growers producing small amounts of fruits and vegetables in seasons hoarding small pieces of agricultural land are advised to construct evaporative cool storage structures. This operates on the principle that spraying water on brick-mud wall structures that removes the chamber heat, by evaporating water and thus the inside temperature is reduced by ~8ºC compared to ambient temperature. This system is more efficient in places away from seashores, with reduced relative humidity, but higher ambient temperatures. This would allow the farmers to store the produce in the field for few days till transported. Minimal processed or cut fruit/vegetable is another technology of fresh produce in ready to consume/cook form. Here, the fruit/vegetable is peeled, deseeded, sliced, pre-treated and stored in specific package (MAP) under optimum low temperature, specific to each commodity, for several fold extension in storage life. This also is a form of value addition, but the product is fresh like. Microbiological quality assumes greater importance, since the fruit/vegetable in natural ready to eat form is packed for storage. Because of the high rate of perishability in fresh form, fruits and vegetables are processed into several forms, choice depending on the specific commodity, to ensure reduction in mass, render storage stability for extension in storage life, for both domestic and foreign trade over distance and time. Thus, sugar serves as a preservative in jam and jelly, whereas salt is the major preservative for pickle. RTS beverage under acidic conditions in pasteurized forms can be stored at RT for ~ 3 months. Dehydrated products with ~5% residual moisture with suitable packages, depending on the low hygroscopicity can find storage life upto 12 months. Intermediate moisture product with ~25% residual moisture is becoming popular to consume mango or papaya ribbons directly in ready to eat form. Storage quality of such forms assumes greater importance. The use of synthetic preservatives is highly questioned in the modern days. However, low concentrations of potassium meta-bi-sulphite and sodium benzoate are still in use. Formation of benzene under acidic conditions of examples like RTS beverages by the use of sodium benzoate is said to be dangerous, as benzene is known to be carcinogenic. This takes us to a subject of food safety including hygiene and HACCP. Good manufacturing practices are practically most useful form of product preparation to expect safety. Stringent laws are in enforcement on the adverse effects of several additives and preservatives, including pre-treatment chemicals and fungicides. Means and methods to remove surface fungicides / pesticides used on fruits / vegetables from the field are of critical importance. This requires prior knowledge of the specific compounds used as spray agents, with due labeling on the commodity packed, so that specific type of washing should enable to remove the pesticide. Use of pesticide on a commodity like cauliflower is directly absorbed and washing cannot ensure removal of pesticides. Here comes the concept of organic farming. This includes avoiding synthetic pesticides and dangerous chemicals during production of the fruit or vegetable in the field. Manure too requires to be generated in country yards, without artificial composting with synthetics. Such an organic farming requires suitable certification. Cost could be more, since the yields per unit land cannot be comparable with yields on plots with synthetic fertilizers and use of pesticides. Storage quality and the nutritional value of such organic produce become again facets of research to be done in detail. Genetically modified foods fall in this context, which require clearance based on their chemistry, consumption and side effects, if any. Accordingly, this chapter is dealt essentially drawing references, focusing research and development in the above areas indicated, covering a cross section of the varied and different means and methods of storage treatment, preservation and processing of fruits and vegetables for extended storage, safety and consumption. Vegetables and fruits are the next in demand for human consumption after rice and wheat, in all parts of the globe. Fresh fruits & vegetables and their value added products are increasing in popularity day by day almost in all the countries, because of their richness in dietary fibre, minerals & vitamin contents and for their medicinal properties. Maintaining agricultural produce quality and its evaluation are thus naturally important. Decisions concerning maturity and ripeness of fruits and vegetables are based mostly on visual inspections, which are subjective in nature. The quality of fruits and vegetables is mostly decided on the basis of size, shape, colour, gloss, flavour, firmness, texture, taste and freedom from external as well as internal defects. Internal quality factors such as maturity, sugar content, acidity, oil content and internal defects, however, are difficult to evaluate non-destructively. Methods are needed to better predict the internal quality of fruits and vegetables without their destruction. Recently, there has been an increasing interest in non-destructive methods of quality evaluation, and a considerable amount of effort is being made in this direction. But the real problem is how these methods are to be exploited practically on commercial scales and what are the constraints faced in implementing them. In this chapter, emphasis is made on non-destructive quality evaluation methods for fruits and vegetables that are useful in evaluating maturity, ripeness, external defects, internal defects and compositional analysis such as sugar, acidity, chlorophyll, carotenoids, etc. The primary objective of non-destructive quality evaluation is to maintain the standards consistently at all levels and tolerances acceptable to buyers at a minimum cost. As of now, subjective evaluation by human beings is the method followed for quality determination, for sorting and grading of fruits and vegetables, but for bigger scale of operations, it is difficult to maintain consistency. Quality evaluation of fruits & vegetables using our senses such as sight (colour), taste (mouthfeel), smell, touch and sound are very subjective in nature. Appearance/colour, texture and flavour represent the three quality parameters which are required to be related for the acceptance of a material by the consumer, which is really a tough task. Methods of non-destructive, accurate, fast and online quality evaluations of fruits & vegetables are the need of the hour and can very much improve cost effectiveness and productivity. Food is processed for its preservation, hygienization or value addition. To date, the food preservation technologies such as canning, dehydration, freezing, pasteurization and controlled atmosphere and modified atmosphere packaging have been the main processes employed to preserve foods, with the use of antimicrobials and microwaves also being employed more recently. In future, however, technologies such as exposure to ionizing radiation, high pressure processing, ohmic heating and pulsed electric field processing, could potentially be the new alternatives to the above food preservation technologies. Irradiation of food involves the exposing of food, either in prepacked form or as such to controlled doses of ionizing radiation being generated either by electrically driven machines such as electron beam accelerators, x-rays or gamma rays produced by radioactive isotopes such as CS-137,CO-60, to achieve certain desirable objectives. The process of exposing a range of food stuffs to specific doses of ionizing radiation is being used to extend the shelf life of food stuffs, to improve their overall safety and quality by eliminating pathogenic bacteria, by reducing number of food spoilage organisms, to reduce the bacterial load on herbs and spices and thereby making them safe to incorporate into food stuffs, to inhibit sprouting in stored tuber and bulb crops such as potatoes, onions and garlic, to disinfest grains, grain products and tropical fruits to prevent damage to the commodity and to meet the quarantine regulations(Arun Sharma, 2004, Farkas, 2006). Irradiation technology offers a sustainable, ecofriendly, less energy intensive treatment for the control of insect pests, spoilage causing microbes (bacteria and molds) and for physiological processes controlling ripening and senescence of fruits and vegetables. At present, Irradiation technology has been recognized world wide as the commercially viable, adoptable preservation technology for a range of food commodities including fruits and vegetables by contributing to improved food safety and security measures and to boost trade as a proven sanitary, phytosanitary and preservation technique. Currently, some 50 countries granted national clearances of irradiation of at least one or more food items or food classes (Farkas, 2006). Irradiation technology is being used for bulk radiation processing of spices, herbs and dehydrated vegetables for their preservation, hygienization or value addition (Farkas, 1988, 2001C, 2006) and every year, nearly 90,000 tons of various food products are being irradiated (Rubio,2003). In the late 1990's, commercial irradiation of bulb crops has been followed in the Asian countries, predominantly in China and India (Farkas, 2006). Irradiation of food involves the exposure of food to controlled application of short wave energy of ionizing radiations, through the radiation field allowing the food to absorb desired amounts of radiation energy to achieve specific objectives such as extension of shelf life, insect disinfestations and elimination of food borne pathogens and parasites. The food itself never comes in contact with the radioactive material. So, food processed by irradiation is not in any way made radioactive, regardless of dose absorbed or length of time the food is exposed to. It can prevent growth of both pathogenic and spoilage microorganisms thereby aiding in preservation of the food and making it safe for consumption. It can be used for insect disinfestations of fruits, vegetables for quarantine, dry fruits and raisins. It can be used to control sprouting and rooting in bulb crops such as onion, shallots and garlic and sprouting in tuber crops such as potato, yam and rhizomes such as ginger. It can also slow down ripening and senescence in fruits such as mango, banana and papaya and vegetables by inhibiting the key enzymes of the physiological processes of fruits linked to the ripening process. It can be used to microbial decontamination and disinfestations of spices and their shelf life can be extended by reducing the spoilages due to microbes and pests. It can inactivate the pathogens and parasites and extend the shelf life of meat and poultry and their products. It can control the pathogens and microbial load in fish and shrimp. It can be used for disinfestations of the dried fish. It is used to eliminate parasites and pathogens of public health importance in food.Merits of food irradiation include, it causes minimal changes in food and preserves food in natural form. It is a cold process and does not destroy heat sensitive aroma constituents. Considering the above technological benefits of radiation processing of food and its products, a worldwide standard covering irradiated foods was adopted in 1983, by the Codex Alimentarius Commission, a joint body of the Food and Agricultural Organization (FAO) of the United Nations and the World Health Organization (WHO). This was adopted after a safety clearance for the use of up to 10 kGy for food irradiation, without any further testing was granted by a Joint Group from FAO, WHO and IAEA (International Atomic Energy Agency). This was further revised in 1997 stating that there is no threat to safety as long as sensory characteristics of the food were maintained and harmful microorganisms destroyed, irrespective of the dose of irradiation (Molins, 2001). Although, the commercial application of the technology is limited in today's world with regards to the volume of food being irradiated, considering its long history of research carried out by various countries over the last 6 decades, it stands out as a technology of the future as more and more countries are trying to adopt and exploit it commercially to minimize losses of valuable food commodities. The applicability on the contrast is very diverse and the technology can be used in preservation of various kinds of food of both plant and animal origin. India is the second most populated country with an alarming population rate increase and this is putting additional burden on the nation as far as its depleting natural resources and availability of food is concerned. It is hence imperative that all efforts of the scientific fraternity in India needs to be focused in devising ways to help farmers and in turn the nation by minimizing post harvest losses of foods. So that India could increase its food production not only to be self sufficient but it can boost its export potential in the international market to gain valuable foreign exchange from food exports. Pectin is a polysaccharide present in the middle lamella of plant cell walls. The firmness and structure of the plant tissue are attributed to the presence of pectin in the middle lamella. The insoluble form of pectin is called protopectin and the soluble form is called soluble pectin (Kertez, 1951). Protopectin is abundant in green fruits and contributes to hardness of cell, where as soluble pectin is responsible for viscous nature of juice and pulp. Conversion of protopectin to soluble pectin results in loosening of the bonds between the cells and softening of the fruit tissues. Protopectin is reported to be hydrolyzed to pectin by enzyme action during ripening. Protopectin on restricted hydrolysis yields pectin or pectinic acid. Braconnot (1825) discovered pectin as the gelatinous principle of fruits. Health benefits associated with consumption of foods supplemented with citrus pectin such as glycemic control, serum cholesterol concentration, pectin and cancer and mineral balance were reported (Baker, 1994). At present there is an increasing demand for colourants from natural sources. Since there is a possibility of banning of synthetic colours in view of their carcinogenic properties and already a reduction in number of permitted synthetic colours from 13 to 8 numbers in our legislation (PFA, 2005), the demand for natural colours is evident. In Japan and European countries because of the green movement, the demand for synthetic colours has been reduced. Synthetic colours in global market account for 400 million dollars. Despite processing limitations and higher costs, the global market for natural colours is estimated to be more than 939 million dollars (Espszezola, 1998). Color is recognized as a major factor affecting food acceptance. The consumer expects a specific food to possess a well defined colour and rejects any appreciable deviation from the normal. The change in colour during the preparation of food is a useful guide to quality control and is used by many food processors as the criterion for selecting raw materials. The characteristic colour of raw food is due to the natural pigments present in the plant and animal material. These can be enhanced in processed food products through the addition of food colourants. Addition of colour can make up for the colour losses during processing. Some of the major groups of colours are anthocyanins, carotenoids, betalains, chlorophylls, flavones and chalcones. Some of the plant sources of pigments are kokum, roscelle, chilli, marigold, beetroot, grapes and safflower. Sources of natural colours can be plants, animals or microbes. Fruits and vegetables form one of the main plant sources of pigments. Some of the plant materials rich in colours viz., alfalfa, marigold, safflower, strawberry, aronia fruits, grapes, red cherries have been exploited for pigment extraction and the results have shown positive effects. Some of the interesting features of the work carried out by researchers in this area are presented in the following sections. Over the years, numerous procedures have been proposed for the isolation of aromatic compounds and pigments from plant materials. Plant pigments can be broadly divided into major 2 groups of pigments viz., water soluble anthocyanins, beatalains and fat soluble carotenoids, chalcones and cholorophyll. The sources of plant materials with group of pigments are shown in Table 1. Generally, the methods of extraction followed for aroma and pigment from plant materials are solvent extraction, hydro-distillation, steam distillation and super critical carbon dioxide extraction. Enzyme assisted extraction is a recent approach for colour extraction from plant materials. Increase in extraction efficiency by any new approach is welcome when viewed in terms of the value added end product. Studies have been carried out with enzymatic approach for colour extraction as a pretreatment or fermentation (ensilage) combined with enzyme treatment. Advantages of enzyme – assisted extraction of color in some of the plant materials, in comparison with conventional methods are dealt (Sowbhagya and Chitra, 2010). In this era of genomics, proteomics and metabolomics the challenge in nutritional science is to clarify human nutrient requirements and design nutritional strategies to promote health and functional longevity. Our ancient Indian belief that ‘we are what we ate’ and our future health as individuals may well depend upon what we eat today. Plant-based dietary antioxidants are believed to have an important role in the maintenance of human health because our endogenous antioxidants provide insufficient protection against the constant and unavoidable challenge of reactive oxygen species (ROS). We have various endogenous defense chemicals but they are inadequate to prevent oxidative damage that makes human system prone to various degenerative diseases. Hence, it is necessary for increased intake of dietary nutraceuticals that may help maintain the balance between oxidants and antioxidants, slow age-related changes, and prevent onset of degenerative diseases. Pulpy and juicy fruits like orange, guava, banana, grape, mango, papaya, pears, apples and jackfruit can be converted into fruit products like squashes, juices, cordials and ready-to-serve (RTS) fruit beverages. These RTS fruit beverages are both refreshing and thirst quenching and have become very popular. Liquid fruits are the clarified juices prepared from these pulpy and juicy fruits. There is a demand for liquid fruits in the international market for various applications. The liquid fruits can be used as a natural alternative to synthetic beverages. They can be suitably concentrated or diluted, blended with other juices and also can be carbonated as fruit based soft drinks. Removals of pulpy material from the juices make them easier to preserve by pasteurization and are amenable to carbonation. Pulpy fruits can be successfully processed into liquid fruits (clarified juices) by using pectic enzymes. The emphasis of the fruit juice processing industry has, so far, been mainly on conventional clarification processes like enzymatic and chemical treatments followed by filtration using filter aids; and concentration by vacuum evaporation. Clarification of fruit juices (removal of suspended particles) gives the juice better appearance, easier to preserve by heat and possible to carbonation or blending. Removal of pulp or solid in juice processing is a unit operation, often requiring multiple steps and possible pretreatments. Fruit juice is currently clarified by conventional methods like chemical and enzymatic treatments which are laborious and time consuming, and require high amount of enzymes, chemical finings, filter aids, large settling tanks, and do not always achieve their purpose. Fruit juice concentration can offer significant advantages to the processor. By concentrating the juice, the bulk is reduced, thereby reducing storage volume requirement and transportation costs. Fruit juice is currently concentrated using multi-stage vacuum evaporators operating at reduced temperatures to reduce the effects of thermal degradation. This process results in a loss of fresh juice flavours, colour degradation and a cooked taste due to the thermal effects. Moreover, the process is high energy-intensive. Since consumers generally prefer the flavour, appearance and mouth feel of freshly squeezed juices, scientists and processors have tried to develop new techniques for retaining such characteristics of freshly squeezed juice in the concentrate and ultimately in the reconstituted juice. The juice industry has developed complex essence recovery, careful process control and blending techniques to produce a good quality concentrate that is acceptable to consumers, but still easily distinguishable from fresh juice (Jiao et al., 2004). The demand for better quality and economy in energy inputs and operating costs has made such processes less attractive, necessitating adoption of alternate methods of fruit juice clarification and concentration. (Girard and Fukumoto, 2000). Tremendous efforts have been made to develop improved methods such as freeze concentration, sublimation concentration and membranes for concentrated juice processing (Chen et al., 1993; Koseoglu et al., 1990). This chapter is mainly focused on production of liquid fruits (clarified juice) and pre-concentration of fruit juices using membrane processes. Intermediate moisture foods are semi moist foods that have some of their water bound by glycerol, sorbitol, salt or certain organic acids, thus preventing the growth of many microorganisms (Stewart et al. 2001). It is now well recognized that fruits and vegetables are dehydrated to an intermediate moisture level (20-50%) (Stewart et al. 2001; Purvi et al. 2003). As the intermediate moisture products are characterized by a semi moist consistency so these foods have enough moisture content to permit easy chewing but low enough water content to prevent spoilage production of intermediate moisture foods is based on an increased scientific understanding of the chemical reactions involved in traditional food preservation methods (Purvi et al. 2003). There will be better retention of original flavor and texture compared to fully dried products, with concomitant reduction in bulk, weight and cost of packaging, transportation and storage. Such intermediate moisture foods are more appropriate for developing countries in view of their minimal processing requirements, stability under ambient conditions, safety, convenience, ease of nutrient content adjustment, energy savings and low capital investment. They are also eminently more suited than dehydrated or canned foods for military rations (FAO, 2005). Traditional intermediate moisture foods (IMF) can be regarded as one of the oldest foods preserved by man. The mixing of ingredients to achieve a given water activity (aw), that allowed safe storage while maintaining enough water for palatability, was only done, however, on an empirical basis. The work done by various food scientists approximately three decades ago, in the search for convenient stable products through removal of water, resulted in the so-called modern intermediate moisture foods. These foods rely heavily on the addition of humectants and preservatives to prevent or reduce the growth of microorganisms and make them stable for longer period. Definitions of IMF in terms of aw values and moisture content vary within wide limits (0.6-0.90 aw, 20-50% moisture), and the addition of preservatives provides the margin of safety against spoilage organisms tolerant to low aw. Of the food poisoning bacteria, Staphylococcus aureus is one of the organisms of high concern since it has been reported to tolerate aw as low as 0.83-0.86 under aerobic conditions. Many of the considerations on the significance of microorganisms in IMF are made in terms of aw limits for growth. However, microbial control in IMF does not only depend on aw but on pH, Eh, F and T values preservatives, competitive micro flora, etc., which also exert an important effect on colonizing flora. Therefore, the demand for healthy, natural and tasty fruits and vegetables continuously increases and it involves not only the final products to be sold to the consumers but also the ingredients to be included in complex foods or multi-components products, such as ice creams, bakery, pastry, confectionery, dairy, desserts and prepared meals. Preserved horticultural products to be used as if they are fresh or used as ingredients in the preparation of complex foods, need to undergo some form of treatment or processing to maintain as much and as long as possible not only the sensory characteristics but also the original composition associated with nutritional properties. Production of intermediate moisture foods from various fruits and vegetables has gained lot of popularity in the recent years. Therefore, it is not only to discuss about the role of water activity in intermediate moisture foods, methods of production of intermediate moisture foods from different fruits and vegetables but also to highlight the characteristics (stability, storage and microbial) of intermediate moisture fruit slices, bars and vegetables. It also deals with the trends involved in protection of intermediate moisture foods by using protective surface layers (films and coatings), which are edible in nature (Guilbert, 1988, Lenart and Piotrowski, 2001; Dehghannya et al., 2006). Presently, there is a need for simple, good quality and inexpensive technologies in order to preserve fruits and vegetables in developing countries to minimize losses due to spoilage occurring as a consequence of high ambient temperatures, humidity and also the inadequate facilities for processing, handling, transportation and storage. Keeping all these above points in view, IMF technology may be more appropriate for such regions. Since, the intermediate moisture products are resistant to bacterial, yeast and mold growth and microbiologically safe for direct consumption. There is intense commercial interest in dehydrated fruit and vegetable products especially mango powder, banana powder, orange powder, papaya cereal flakes to powder, tomato juice powder and other vegetable powders, which are in great demand for soups, biscuit type cookies supplemented with fruit powders (Ana Maria et al. 2009; Sunita and Chauhan 2008), pizza mixes and sauces. Natural fruit and vegetable powders are gaining lot of popularity in recent years as they are very easy to handle after production, require minimum storage space and they are attractive. Tamarind powder is developed from tamarind fruit (Tamarindus indica) (Manjunath et al. 1991) and recently cashew apple and guava residues from fruit juice industry were successfully converted into fruit powders and used at different levels of wheat flour substitution for cookies formulation (Ana Maria et al.2009) and fruit puree like papaya can be mixed with cereal flour to prepare slurry and after gelatinization, the slurry can be useful for preparing drum dried flakes and powder (Sunita and Chauhan 2008). Tropical fruits are exotic in flavor but their juices and purees are seldom available in dehydrated powder (James, 1971). Citrus juice concentrates were produced during world war II in powdered form by using spray, drum, vacuum-puff, and freeze drying (USDA, 1962). The preservation of fruits and vegetables by dehydration offers a unique method, which may be considered as an alternative low cost preservation technique. A shift from fresh to more and more processed foods with significant value addition is bound to occur sooner or later considering the socio-economic changes taking place in the country and the rapid integration of Indian economy with global system. Most popular brands are found in the “ready to consume” food sector. Food export forms a sizeable chunk of the country’s international trade though significant volume of food is also imported. Out of US $ 45 billion exports, food constitutes about 17% valued at US$ 6.1 billion annually. The major fruit growing states are Uttar Pradesh, Andhra Pradesh, Bihar, Karnataka, Tamil Nadu, Maharashtra, Kerala and West Bengal. The post harvest losses are huge and accounted to 20-30%, which is very high considering the nutritional requirement for more than 1 billion population of the country. Through value addition during processing of fruits and vegetables plays a significant role as India produces a wide variety of fruits and vegetables. With the processing sector largely confined to small scale enterprises and unorganized producers, the product mix is heavily weighted in favor of low value added products and unprocessed foods. Bamboo has historically been an integral part of human culture. Bamboo is a mystical plant representing symbol of strength, flexibility, tenacity, endurance and compromise. Throughout Asia, bamboo has for centuries been integral to religions, ceremonies, art, music and daily life. Bamboo provides numerous environmental benefits such as playing a critical role in the balance of oxygen/carbon dioxide in the atmosphere. Bamboo is the fastest growing canopy for the regreening of degraded areas and generates more oxygen than equivalent ultraviolet rays. It is an atmospheric and soil purifier. Its soil conservation properties create an effective watershed, stitching the soil together along fragile river banks, deforested areas, and in places prone to earthquakes and land slides. Its fast growing and high yield nature makes it a highly valued renewable resource. Its low cost and abundance call for its utilization to a full extent. Mushrooms have been part of man’s diet for centuries (Rajarathnam and Shashirekha, 2003). Mushrooms grow on wide range of agro-residues, biodegrade and biotransform them into edible fruiting bodies (Rajarathnam and Zakia Bano, 1988a; 1988b; 1990; Zakia Bano and Rajarathnam, 1988; Zakia Bano et al., 1993; Rajarathnam et al., 1998). Their post-harvest life is very ephemeral at room temperature (Rajarathnam et al., 1983) due to delicate flavor (Rajarathnam et al., 1990) and high moisture content, with a range of chemical constituents (Zakia Bano and Rajarathnam, 1986; 1982; 1988; Rajarathnam and Zakia Bano, 1990; Rajarathnam et al., 1983; 1992). Since, they contain large quantities of water and therefore suffer considerable weight loss during transportation and storage, causes serious economic losses, due to reductions in weight and quality (Gray, 1970). When the supply of water, organic substances and minerals are cut off at harvest, the fresh mushroom enters a deterioration or perishable phase. Cap opening and stem elongation are the usual symptoms of senescence constituting visible evidence of deterioration. At room temperature, the shelf-life of mushrooms cannot be for more than 24 h (Rajarathnam et al., 1983). During this period, there are considerable changes in color, texture and taste. In addition, water is continuously being lost as a result of transpiration and respiration. Additional loss occurs from surface cracks and bruises that develop during growth and handling (Salunkhe et al, 1991). Fresh mushrooms are white or light buff, with no dark marks on either the cap or stem. The veil is closed and the gills are not visible. The upper surface of the caps should be strongly convex and stems should be plump rather than elongated. Mushrooms are grown on compost, usually in mushroom houses where the temperature and humidity can be controlled. Eventually after harvest, the mushrooms can never be able to withstand any increase in temperature and decrease in relative humidity. Mushrooms are commercially preferred at the immature stage characterized by closed caps, invisible lamellae, round stipe and light color. Agaricus development is classified into various stages (Table 1). Thus, the concept of physiology of fresh mushrooms being very complicated, bears a great impact on the delicate problem of extending the storage life. The various means and methods studied and adopted by various researchers to aim at extended storage life of fresh produce, underlined by its physical, chemical and biochemical properties and also development of value added products are critically evaluated. Fruits and vegetables in fresh form in general contain very high water content, with the fast rate of metabolic activity, including respiration rate, which may vary with the fruit type. Accordingly, the storage life at room temperature is considerably less, to expect acceptable quality. A range of transformational changes occur in various features of the fruits and vegetables, such as color, flavor, texture, structure, sweetness, sourness, pungency, astringency and so on. Phenolic browning of mushrooms, intensive softening of papaya, coloration and softening of ripe banana, softening of pear and jackfruit , flavor transformations of mango, banana and jackfruit after ripening, their color and texture transformations, are classic examples of post-harvest changes in fresh commodities, over a course of storage period at room temperature. These physical and sensorial perceptions of fresh commodities over a length of storage period are based on the range and multitude of operations of physical, chemical and bio-chemical reactions occurring in various constituents of the fresh fruit or vegetable such as moisture, pigments, vitamins, pectin, cellulose, hemicelluloses, phenolics, lignin, sugars, flavor compounds, amino acids, fatty acids and so on. In order to increase the storage stability, the fresh fruits and vegetables are processed and converted into various products such as juice, RTS beverages, jam, jelly, marmalade, fruit spread, dehydrated, spray dried powder, frozen stored, fruit cereal flakes, canned, candied, fruit bar and so on. Based on the nature of processing, the original form, shape, size, texture and structure are transformed, however with due maintenance in storage acceptability. A number of external factors are applied to achieve this product range such as heat, air velocity, pressure, radiation, chilling, freezing, vacuum impregnation etc. The ultimate quality of the final product is essentially an interaction between and amongst the various chemical constituents so characteristic of each fruit or vegetable under study, and a sum total of positive and negative reactions related to sensorial acceptability of the product. This quality is again a function of the storage period and the conditions of storage. Consumers in modern days are more health conscious to choose between consumption of fresh or processed fruits and vegetables. For trade over distance and time and particularly for geographic regions not producing a particular fruit or vegetable, it is of utmost importance to process the fresh produce. Enzymatic transformations in color, texture and flavor deserve utmost attention to ensure acceptable quality of the processed product, in particular over the course of storage period or until consumed after transportation and marketing. Microbiological quality of the product in final form is a most vital factor of consumers' health and this is dependent on water activity, sugars and protein / amino acid contents. In this regard, additives and preservatives come into picture. Strict regulations are imposed on their use, type and concentration over a storage period, for healthy consumption. Accordingly, this chapter would deal with several examples of processing conditions influencing the quality of the product, that emanates. Processing involving chemical, bio-chemical, engineering, bio-technological and microbiological methods to achieve a product are vivid, varied and different to different species / variety of fruits or vegetables to target different products. Production and maintenance of high quality are fundamental goals of the US fruit and vegetable industry. Processed products have gained widespread acceptability as they offer the convenience of quick and easy preparation and, in some cases, are superior in terms of freshness and nutritional quality. A review of fruit and vegetable production, processing and quality in the US is presented with reference to: agricultural practices processing practices (drying, canning, freezing, irradiation, fresh cut produce), quality control and evaluation, safety of fruits and vegetables, and role of agricultural produce in human nutrition (Morris and Brady, 2003). Processing of fruits and vegetables causes modification of chemical and physical bonds resulting in a product that is viscous and sticky. Conventional driers have limitations in handling such sensitive materials, however, heat pump driers have been applied in the production of various ready to eat foods and dried instant products for the last 5 yr at SINTEF-NTNU, Norway. One application tested was to convert raw and cold-extruded cranberry and potato/turnip mixtures into high quality instant foods. The new technologies and processing line for the production of these instant foods are described as well as measurement of the properties and quality attributes for raw, intermediate and final instant products.Heat pump drying technology is energy efficient, environmentally friendly and provides a wide range of drying conditions to produce powders with improved properties (Alves, 2002). Effect of extraction variables on yield and quality of pectin extracted from dry orange waste with nitric acid was studied. A factorial experimental design was used and effects of temperature, time and pH of extraction on pectin yield and 'jelly units', i.e. pectin yield x viscosity of pectin solution, were determined. According to ash and methoxyl content determinations, the product can be classified as low ash and high methoxyl pectin. Its purity expressed as anhydrogalacturonic acid content varied from 68.5 to 75.0% (Aravantinos and Oreopoulou, 1992). A process for manufacture of fruit or vegetable juices or purees is based on: homogenization of non-blanched raw fruit or vegetables in the presence of water, under an inert atmosphere, to liberate flavour precursors and endogenous enzymes; incubation of the homogenate at 0-70°C for 5 min-24 h; further processing to juice or puree, and pasteurization. Flavour and colour of juices and purees made by this method are superior to those of similar products made from blanched raw materials (Daury et al., 1997). Changes in quality and quality aspects due to handling of products in the chain, opportunities for manipulating quality and quality aspects in the supply chain, interactions between measuring and modelling for quality and quality aspects, sensory attributes, preharvest quality, postharvest quality, storage conditions, storage treatment, chain aspects, and processing influence are dealt (Proc. Intl. Con., 2003). Injuries caused by partial processing (trimming, peeling, cutting, slicing, etc.) of fruits and vegetables affect physiological activities and, therefore, quality of produce (Watada et al., 1990). Commercial potato storage bins were monitored over 2 storage seasons for CO2 content of the atmosphere and for reducing sugars, sucrose and chip colour of the tubers. Concentration of CO2 in the storages tested ranged from 0.06 to 3.2%. Increases of reducing sugars and sucrose, and darkening of the chips made from the tubers generally occurred immediately after rises in CO2 concentration In most cases the detrimental effect of high levels of CO2 on the colour of the fried products was temporary (Mazza and Siemens, 1990). The biochemical bases for color and firmness changes in fruit and vegetable tissues are reviewed, since appearance and texture are two of the most fundamental factors affecting the quality of fresh-cut products. The intent is to provide a level of understanding that can be used to underpin future research directions in order to resolve existing issues that limit fresh-cut quality and shelf life. The biochemical mechanisms for enzymatic browning mediated by polyphenol oxidase and phenol peroxidase are described, and the importance of limiting cellular damage during the processing of fresh-cut fruit and vegetable products is emphasized. Also described are two mechanisms of chlorophyll degradation involved in discoloration events in green tissues, and examples of coloring processes specific to particular crops (white blush in carrots, discoloration of Allium spp., secondary browning in apples). The loss of desirable texture in fresh-cut products is a major problem. In fruit this is largely due to a continuation of cell wall disassembly events that are a normal component of ripening, and which result in declining cell wall strength and reduced intercellular adhesion. In some species the process is exacerbated by wound-response ethylene. However, wounding, water loss and ripening-related turgor changes are also important contributors to textural deterioration. In fresh-cut vegetables, water loss and damage-induced lignification are common problems. The effects of factors such as maturity at harvest, processing conditions and various treatments to mitigate quality decline are discussed (Toivonen and Brummell, 2008). The potential formation of carcinogenic chlorinated compounds from chlorine in water makes use of chlorinated water for washing of fruits and vegetables during minimal processing a non-ideal practice, thus alternative approaches are sought. Methods suitable for sanitization and enhancing shelf life of minimally processed fruits and vegetables, particularly lettuce and carrot (as examples of leafy and root vegetables), are dealt. Evaluation of the quality of minimally processed vegetables, particularly use of colour and texture as quality indicators, microbiological quality and sensory quality, methods used to extend product quality, i.e. inhibition of browning, modified atmosphere packaging, modifying pH during storage; chemical-based washing treatments including organic acids, H2O2, Ca-based solutions, ozone, electrolysed water and natural preservatives, physical treatments used for extending shelf life of minimally processed fruits and vegetables, namely, modified atmosphere packaging, blanching and heat-shock, gamma-irradiation, UV irradiation, high pressure processing, and use of hurdle technology are considered (Rico et al., 2007). In closed jars, cucumber fermentations with and without NaCl in the fermentation brine were similar both in the chemical changes caused by the fermentative microorganisms and in the retention of firmness in the fermented cucumbers, when cucumbers are allowed to ferment in brine containing CaCl2 as the only salt (McFeeters and Perez Diaz, 2010). Orange-fleshed sweet potato (OFSP) can be used to tackle vitamin A deficiency, a major public health problem in most developing countries. Losses of carotenoids during storage were considered to be more of a nutritional constraint to the utilization of dried sweet potato, than losses occurring during drying (Bechoff et al., 2010). From the earliest time, man had to conserve and preserve his food, so that surplus at harvest following a successful crop can be stored for use throughout the year. Prime agricultural products in general and more so with fruits and vegetables which are being processed world wide or preserved to a more stable form so that they can withstand transport, handling and storage over a long period. As civilization developed, man learnt to preserve fruit and vegetable products with salt, spices and by drying , smoking or cooling which could extend their shelf life. Later by experience, he learnt that by protecting it from environmental factors such as air, moisture and light, the shelf life of these processed products could be further increased. He tried to keep them dry and covered to protect from insects and rodents. As with solid foods, primitive man experimented with beverages also. It is likely that the first beverage known to him after water was fruit juice. This undoubtedly led to the discovery of wines made from the fermented fruit juices. Later on, preservation methods and development of packaging materials underwent drastic changes. The history of food packaging goes back to the dawn of human civilization. Early man was using large vegetable shell as container, probably for water. When he processed fruits and vegetables for palatability and to provide variety and preservation, there was a great need for the container to preserve them which he did using stone wares, ceramics, glass and metal. Popularisation of preserved food products has lead to the development of food processing industry as processing not only offer the convenience of quick and easy preparation but also are comparable and in some cases superior to fresh forms in quality and nutritional value (Morris & Brady 2003). The modern packaging era began with the invention of a process to preserve food products in glass containers successfully by Nicholas Appert during early 1800s. By hermetically sealing food in bottles and then cooking it to destroy harmful bacteria, the shelf life of products was extended many folds. General line cans were preferred to glass bottles which were followed by Open Top Sanitary cans and other developments in metal containers. Other methods of food preservation which are developed later are pasteurisation, refrigeration, freezing, use of oxidation and mold inhibitors, aseptic processing and packaging and application of hurdle technology. In 1950s the development of many polymeric plastics interacted with the development of many food preservation techniques to expand the variety of tasty, safe, nutritious foods with a longer shelf life that could be transported over long distances. Packaging has an enormous impact on food preservation. Packaging is key to the successful marketing of modern food products. Apart from extending shelf life and aesthetic appeal, packaging provides convenience of size, shape and ease of opening. Packaging materials with appropriate barrier properties are chosen to design suitable package for foods depending on their physical nature and to preserve the quality and nutritive value of foods by exclusion of oxygen and control of moisture transfer. Packaging also prevents spoilage of food by microbial or insect attack. Selection criteria of a plastic material for packaging is not limited to its suitability in terms of shelf life and other requirements but also includes its compatibility with the packed food. If a food product is processed after packing, the packaging material also should withstand the processing conditions and if the products are stored in freezers, the packaging material should withstand the freeze temperature. The migration of potentially toxic moieties from packaging material to the food packed in it is of major concern in the selection and use of plastic packaging materials for food packaging. This chapter deals with rigid containers made of glass and metal, their development over a period of time, apart from the usage of plastic packaging materials for food contact applications. The packaging requirement of some processed fruit and vegetable products, selection of functional and economical packages for them for the required shelf life have also been dealt with. Fruits and vegetables have been an integral part of man’s diet from immemorial times. Fruits are the portions of plants that bear seeds, while vegetables are the edible components of a plant, including the leaves, stalks, roots, tubers, bulbs, flowers and seeds. These can be eaten raw or cooked. Fruits and vegetables can be preserved for short-term intervals under refrigeration, with or without receiving a minimal treatment like slicing, chopping, shredding or peeling. Fresh produce may also be irradiated or packaged in controlled or modified atmosphere in films for short-term storage. Long-term preservation includes canning, juicing, drying and addition of preservatives. Food contamination with hazardous biological agents remains a worldwide challenge in food safety and nutrition (Kenny 2002; Schlundt 2002; Tauxe et al 1997). Microorganisms form part of the epiphytic flora of fruits and vegetables and many will be present at the time of consumption. Production practices, growth conditions and the location of the edible part during growth (soil, soil surface, aerial part) will in combination with intrinsic, extrinsic, harvesting and processing factors affect their microbial status at the time of consumption. Man-made sources may be directly from farm laborers and from the equipment used for harvesting or storage. The types of microorganisms on fruits and vegetables would also vary with the orchards, vineyards or growing fields. The resident microflora normally subsists on the slight traces of carbohydrates, proteins and inorganic salts that dissolve in the water exuding from or condensing on the epidermis of the host. The numbers of bacteria present will vary depending on seasonal and climatic variation and may range from 104 to 108 per gram. The inner tissues of fruits and vegetables are usually regarded as sterile (Lund 1992). However bacteria can be present in low numbers in the insides of the fruits and vegetables as a result of the uptake of water through certain irrigation or washing procedures. Fruits and vegetables differ in the kind of microflora that they naturally harbour. While fungi are more prevalent in fruits, bacteria are dominant on vegetables. This is due to the intrinsic properties of these two foods. The lower pH of fruits and the presence of a number of organic acids like, citric, malic, acetic, etc, are inhibitory to the growth of many bacteria but not of fungi. The microbiological safety concerns of all fruit and vegetable products processed or unprocessed are not the same. For example, tomato when sold fresh may carry Salmonella spp, pathogenic E.coli or other bacterial pathogens on the outer skin, but the preparation of ketchup from the same vegetable by thermal treatment together with modification of the intrinsic properties of the product, makes these safety concerns no longer relevant. The microbiological safety aspects of these various categories of fruits and vegetables will therefore be discussed separately. The chemical composition of a food is of utmost importance from many standpoints, including nutrition, safety, and stability to microbiological, chemical or physical changes. Analysis of these food components is required to provide nutrition labelling for informing the health-conscious consumer, for quality assurance during processing and storage, and for regulatory purposes. The methodology used in analysis will depend on the particular component and the nature of product being analyzed, the purpose of the analysis, and the availability of resources. The emphasis of this chapter is on understanding the principles, procedures and calculations involved in estimating a particular component in fruits, vegetables and their products. Banana is the developing world’s fourth most important food crop (after rice, wheat and maize) accounting for 70 million metric tons per annum (FAO stat, 2007 faostat.fao.org/site/567/Desktop Default.aspx?). Banana is also the second highest fruit crop in the world, representing a wide range of varieties of cooking and dessert types, providing a staple, nutritious inexpensive food for millions of people. The word “banana” is a general term embracing a number of species or hybrids in the genus Musa of the family Musaceae known simply as the banana family. Two Musa species namely Musa acuminata and Musa balbisiana, out of the 28 described were first noted in 1865 by Kurz as being the origin of most of the commercial clones (Stover and Simmonds 1987). Cultivated clones are parthenocarpic, mostly sterile with starchy fruits. Indeed, wild types are very fertile; their fruits are full of seeds with little starch, and are seldom fit for human consumption. Its abundance, varietal diversity, availability round-the-year and low cost make banana an important commodity for the religious occasions in many tropical countries. The vegetable bananas, generally grouped under ‘Plantains’ are larger, more angular than dessert type and are generally intended for cooking unripe, although ripened ones are quite like dissert bananas.Edible Musa spp. originated in south-eastern Asia are distributed from eastern part of India to northern Australia (Stover and Simmonds, 1987). It is said that when Alexander the Great visited India during his campaign in 327 A.D., he savored bananas and took them to the western world. Early Filipinos probably spread the banana eastward to the pacific islands, including Hawaii, prior to recorded history. In the West, banana probably followed the major trade routes that transported other fruits during 500 AD. Bananas were not carried to Europe until the 10th century, and Portuguese traders obtained it from West Africa, during that period (Morton 1987). Plants were taken from West Africa to the Canary Islands and South America in the 16th century, and spread throughout the Caribbean with settlement of the area in the 16th-17th centuries. Bananas are now grown throughout the tropics than any other fruit crop in the world. The two major banana producing countries in the world are India and Brazil but neither of these exports significant quantities. As dealt in earlier chapters, fruits and vegetables represent the most essential of horticultural component for acreage of production, yield, nutritional and nutraceutical values, of definite taste, texture, flavor and colour, involving defined health and medicinal benefits. Every year and over the course of every ten years, significant quantum of research data accumulates on the various facets of fruit and vegetable technologies, and also trends in production, processing and marketing, may also tend to change. At every stage, more thinking has gone to improve the technology, product quality and cost economics to suit wider markets, both domestic and foreign. It is a continuous endeavor to record newer and newer problems emerging and to set the strategies to solve them. Several relevant references, fitting to the various aspects representing the cross section of the fruit and vegetable technologies are dealt here, to conclude the subject and spell out the future. Consumer demand for healthy convenience meals with ‘near fresh’ properties challenges researchers and industry to develop new or improved conservation procedures for processed products. Development of a dehydration process based on electromagnetic energy (EME) may bring about a major breakthrough with respect to retention of product quality and improved rehydration characteristics (Nijhuis et. al., 1996). 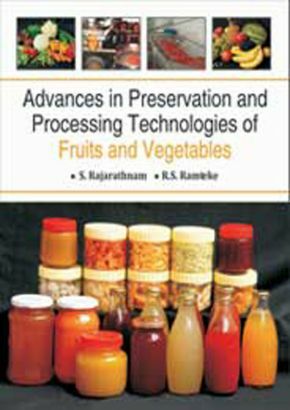 Economic potential and current limitations of fruit and vegetable processing in India included improvements in preliminary treatment (harvesting, washing/cooling) precooling (including refrigerated transport/storage) and processing of juices and pulps. Establishment of a National Horticulture Board has aided to provide market information and so aid growers to get remunerative prices (Anon, 1993). The use of food irradiation as a quarantine method for treatment of food and agriculture commodities was organized by the joint Food and Agriculture Organization/International Atomic Energy Agency Division of Nuclear Techniques in Food and Agriculture, held in Kuala Lumpur, Malaysia, on 27-31 Aug., 1990. (FAO,1992). This has been experimented with various commodities, particularly for export trade of fruits like mango, as stipulated by the importing country like U.S.A. The market for processed apples (e.g. canned apples, juices, concentrates and pulps) is related to prospects for the Hungarian apple processing industry (Kiss et. al., 1992). A method for processing prepared materials (fruits and vegetables products) in a nitrogen atmosphere at a gauge pressure of greater than or equal to 50 kPa by using physical steps to prevent oxidation and undesirable propagation of microorganisms, and to maintain the natural flavour of the materials is described (Nozaka, 1990). Work by the Federal Institute for Cereal and Potato Processing, Detmold, Germany, on use of apple pectin extract (APE) in bakery products is reported. Addition of APE at 2% of DM during manufacture of mixed wheat, mixed rye and whole meal rye breads was shown to increase dough and bread yields, intensify crust browning and give a darker, softer crumb, and to give a fuller flavour than with untreated bread (Bollinger, 1992). The evolution of the World Citrus processing industry is surveyed along with current citrus production statistics. World production of citrus and outlooks for the Brazilian and Florida citrus industries are considered giving the latest statistics in some detail. Production of frozen orange juice concentrate in Brazil is outlined and various innovative technologies that have been introduced by the Brazilian citrus industry is reviewed including the use of sugarcane bagasse, production of alcohol from citrus and methods of fruit transportation. Changes in citrus juice markets over the last decade have caused new products to be introduced and the trend toward fresher tasting, less processed forms of commercial citrus juice is examined. Technologies such as freeze concentration, membrane concentration, production automation, juice quality enhancement technology, and by-product recovery technology are surveyed with regard to their impact on world consumption patterns (Fox, 1991).